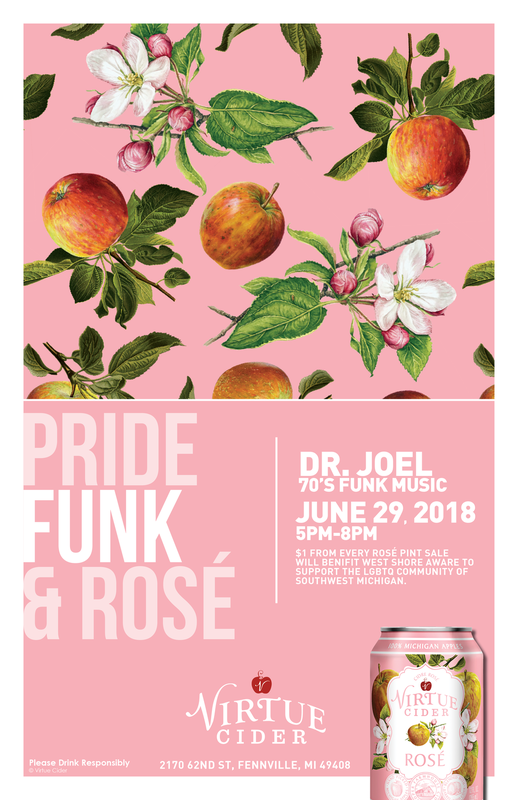 We are celebrating Pride Month, and celebrating our community with a night of funky music and funky cider, benefitting West Shore Aware. Join us for our 70s funk dance party from 5-8pm. We'll be donating $1 from each pint of Rosé sold from Friday, June 29 to Sunday, July 1 to West Shore Aware, a philanthropic organization of gay men and women and their allies living in Saugatuck/Douglas and the greater West Lakeshore community. The organization is dedicated to increasing the positive influence and public awareness of the contribution that gay men and women make to the community in which they belong.